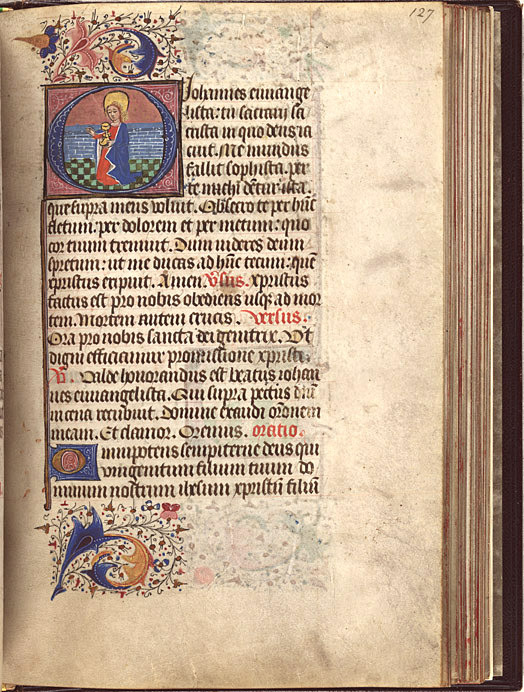 Popular throughout Europe from the late thirteenth to the sixteenth century Books of Hours were prayer books intended for devout everyday folk who wanted to follow the Church’s programme of daily devotions. They always included a series of prayers to the Virgin Mary but also varied in the choice of other saints recognized and in the number, size and quality of illustrations. These books could either come readymade or be specially tailored to a person’s own circumstances and interests. Ref: Catholic Church, Rossdhu Book of Hours, 1475-1500, Sir George Grey Special Collections, Auckland Libraries, 7-C1906. Most Books of Hours display the months of the year and the activities associated with them. 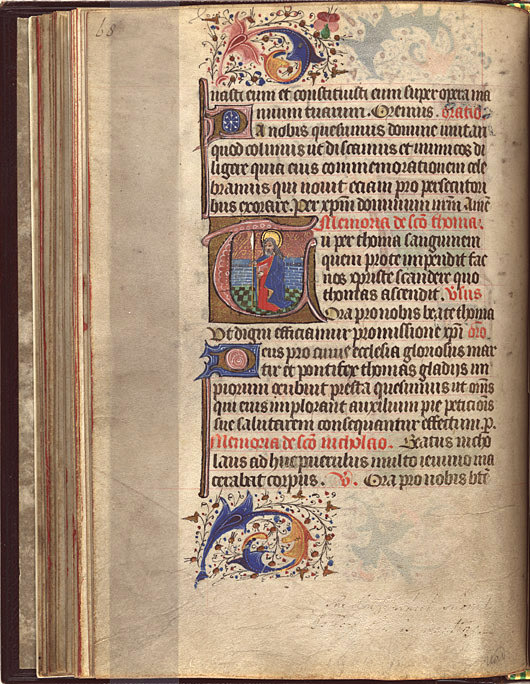 In the Rossdhu Book of Hours the feast lists for the months are given in full. The calendar also lists which saints are celebrated on particular days. Special feast days as well as local saints are written in red or with colour and illumination. There are also a series of prayers and hymns which cover a number of events such as death or forgiveness. The date of the dedication of the chapel of St Mary of Rossdhu, 6 April 1469, is recorded in the manuscript’s calendar. 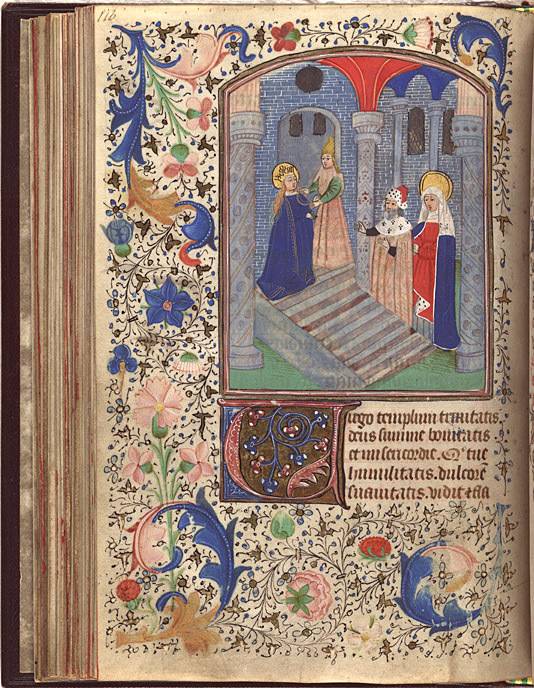 The Rossdhu Book of Hours was produced by a workshop in the Southern Netherlands, probably in Bruges, during the last quarter of the fifteenth century. It is believed to have been used by Lady Elizabeth Dunbar, Countess of Moray who was the second wife of Sir John Colquhoun. They lived at Rossdhu, near the village of Luss on Loch Lomond in Scotland. Colquhoun was a favourite of both King James II and III and in 1457 was granted a charter of the lands in the shire of Dunbarton. Shortly after this the castle of Rossdhu was built. Ref: Rossdhu Book of Hours, page 68, 1475-1500, Sir George Grey Special Collections, Auckland Libraries, Med.Ms G.146. 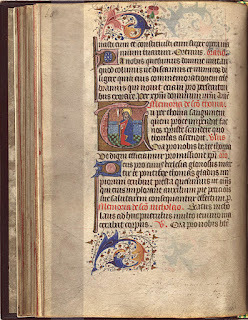 The Latin text is written on vellum, mainly in dark brown ink, but with the titles of prayers, chapter headings and instructions in red. It is written in a large Gothic script in which there is some unevenness in the execution. Many of the words are abbreviated and the first letter of the word at the beginning of the verses is usually in gold or blue. Red lines are visible on the page which outline the space for the text as well as being guidelines to help print the text straight. Many pages also have decorative boarders of acanthus leaves, flowers and fruit. The acanthus plant was found throughout Europe and the carved patterns of the leaves were inherited from classical architecture most notably Corinthian columns. 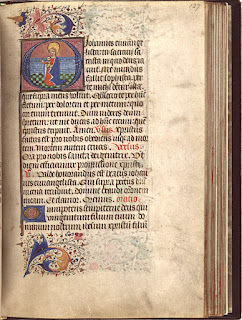 Strawberries (as seen on the page below) also appear on a number of the illustrated borders with them symbolising the Virgin, purity and martyrdom. Ref: Rossdhu Book of Hours, page 116, 1475-1500, Sir George Grey Special Collections, Auckland Libraries, Med.Ms G.146. It is the size of a regular book so would have been easy to carry around. It is bound in nineteenth-century English dark-brown morocco. The exterior is brown, glossy and has a debossed floral design which gives it a sense of importance and value. The contents of the book are standard for the time with the usual late medieval emphasis on devotion to the Holy Eucharist and the Passion of Christ. There is no attempt at historical accuracy however with the figures wearing fifteenth-century clothing. Ref: Rossdhu Book of Hours, Front cover, 1475-1500, Sir George Grey Special Collections, Auckland Libraries, Med.Ms G.146. 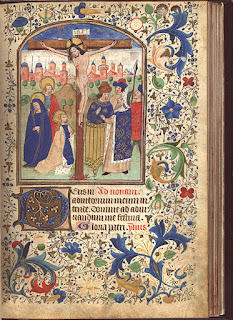 There are twenty-five large miniature paintings in the book with most illustrating the Passion of Christ as well as saints. These miniatures are surrounded by detailed illustrative borders of leaves, fruit, and flowers and are illuminated in gold and colour. What is first striking is the vibrancy of the colours especially the blue and the red, you would be forgiven thinking that it wasn’t centuries old. The faces of the figures are generic with no distinguishing features. Some of the saints depicted are those whose cults are centred in Ghent which indicates that the script or the prototype was written for the use by someone in the Low Countries. An early addition to the calendar of Saint Ninian suggests that it was used In Scotland. Most of the significant additions to the calendar are a small group of Scottish saints. Ref: Rossdhu Book of Hours, The Crucifixion, page 87, 1475-1500, Sir George Grey Special Collections, Auckland Libraries, Med.Ms G.146. The crucifixion, which is probably one of the most recognisable and important scenes is depicted. In fact the Passion of Christ series is portrayed chronologically in the book. Christ is shown nailed to the cross with streams of red depicting bleeding. To his right look to be his followers as they like Jesus have halos showing them as divine. The halos are gold leafed which emphasises their divinity with how it illuminates in the light. There is also gold detailing on the clothes of the figures. His mother, the Virgin Mary, is mostly likely the figure who is dressed in blue and red as they are her traditional iconographic colours. To his right is another group, possibly those who sentenced him as they are not shown with halos. Jesus is stylistically an unrealistic figure with his arms being very skinny, elongated and not in proportion to his body. There is evidence of creating space with the overlapping of figures and the cross looks somewhat three dimensional with some tonal modelling. There is some fading in the decorative border with some flowers almost being hard to see. Ref: Rossdhu Book of Hours, Saint Katherine, page 39, 1475-1500, Sir George Grey Special Collections, Auckland Libraries, Med.Ms G.146. Saint Catherine of Alexandria/of the wheel was a Christian saint and virgin. She was both a princess and a scholar and in art is usually depicted lavishly dressed with her crown and wheel. 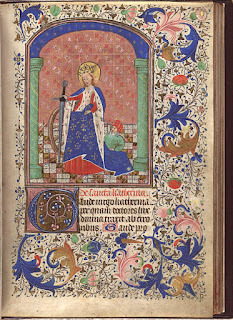 In this Book of Hours she has her traditional iconography including the sword which she was executed with. She wears the symbolic colours of red and blue that the Virgin Mary is often depicted it. Blue signifies her spirituality and relationship with god while the red represents her humanity. As she is a saint she is shown with a golden halo which like the rest of the composition is two-dimensional. Catherine is decorated in gold with her crown and halo appearing to be done in gold pigment rather than gold leaf. There are also accents of gold on her dress and on the wall behind her. There is some evidence of the artist creating a three-dimensional figure with the folds of her dress. The artist has also endeavoured to create depth with the overlapping of objects. There are a number of smaller miniatures which are incorporated on pages with text. Like with Saint Catherine and the Crucifixion they have the same amount of detail, colour and gold accents which shows the skill of the artist. Ref: Rossdhu Book of Hours, page 127, 1475-1500, Sir George Grey Special Collections, Auckland Libraries, Med.Ms G.146. There is gold leaf detailing on almost every page. It is this aspect that really makes the book special. It brings the page to life and illuminates the text. The book would have most probably been read by candle light so the pages would have really sparkled. The scenes throughout the book display the traditional iconography of the figures making them easily recognisable. 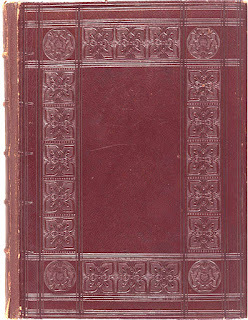 The Rossdhu Book of Hours was one of several medieval manuscripts that Sir George Grey purchased in 1863 from the London booksellers Thomas and William Boone. 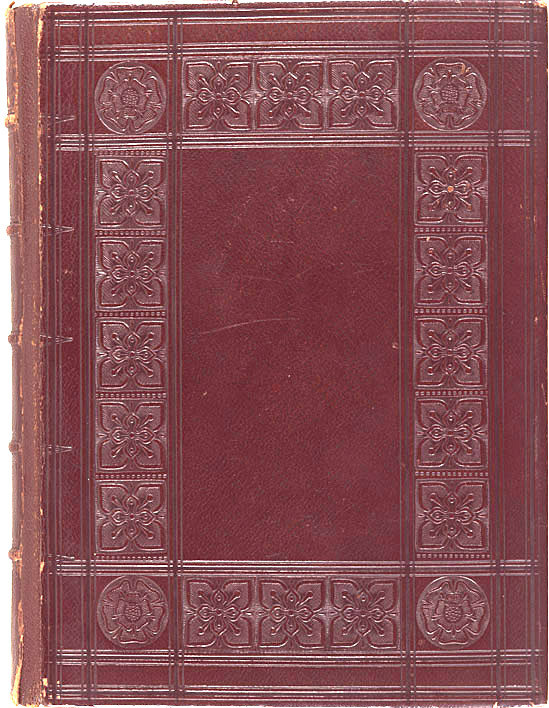 It was among the first consignment of precious books that he donated to the Library in 1887. 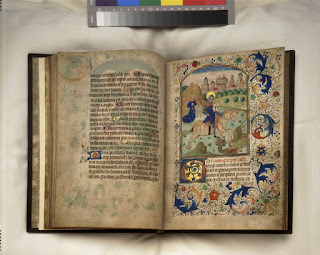 The entire Rossdhu Book of Hours is digitised and can be accessed together with a detailed essay by Manuscripts Librarian, Kate de Courcy via Auckland Libraries website. This is a guest post written by Ashley, a student who is spending some time with us over her mid-term break.